Two Russian airlines – regional RusLine and the country’s fifth largest carrier UTair – have joined forces to implement what RusLine’s outgoing general director Dmitry Mirgorodsy calls a classic feeder network scheme, revealing that his airline had been in talks with potential partners for some time. As it turned out, UTair was a good match and the two airlines have now signed an interline agreement whereby RusLine is moving from Domodedovo to join up with UTair at its Vnukovo, Moscow base. “Since Vnukovo serves as the base hub for UTair, we obviously had to start operating from there too,” Mirgorodsky explains. In total, the regional airline has switched 12 scheduled domestic routes and one international service to Vnukovo. They are Belgorod, Vorkuta, Voronezh, Ivanovo, Izhevsk, Kirov, Kursk, Lipetsk, Penza, Tambov, Ulyanovsk, Elista and Leipzig in Germany. In addition to the interline relationship, the partner airlines are also working towards a code-share agreement, which would give the passengers of each airline direct access to the other’s route network. “We have other cooperation ideas as well, but it’s too early to disclose them. At any rate we hope the cooperation will expand,” RusLine’s Mirgorodsky adds. He also points out that the airline is already seeing the commercial benefits of the partnership, including an increase in ticket sales and the optimisation of costs, particularly through attractive terms offered by Vnukovo and its handling agents. 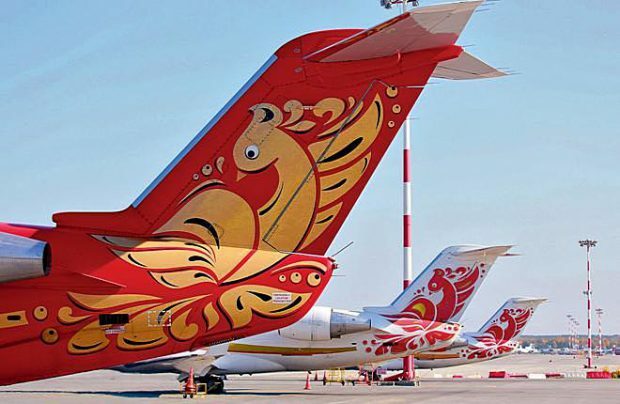 RusLine operates a fleet of 20 vintage Bombardier 50-seat CRJ100/200 regional jets. In 2017 it carried 641,000 passengers on 19,600 flights, 5.5 per cent up on 2016. Its RPKs reached 508,400 pkm.